Carers Trust Scotland were delighted to work with the Empowering Professionals to Support Young Carers in Scotland youth advisory group to help them consider their future and Realize their own unique Potential. 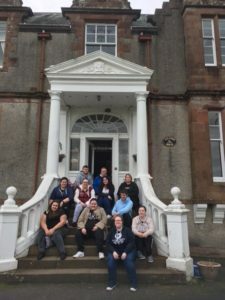 In October 2017, Carers Trust Scotland took 11 young adult carers to a 3 day residential training weekend at the World Peace Sanctuary in Dumfries and Galloway, Scotland, to work with them to consult and consider their own aspirations for their future and discuss self-management. Over the course of the 3 days the young people took part in a range of activities form discussion, group work, games, art and music. Through these activities the young people considered their own aspirations for further and higher education, money management, employability and volunteering. The young people also took part in a range of activities aimed to increase confidence, learn new skills and team working. 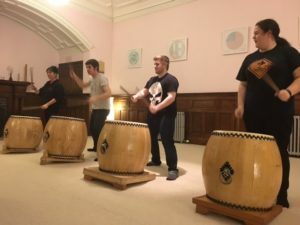 One of these activities included learning about and experiencing Taiko Drumming, a style which originated in Japan.